I might have been a bad parent this summer. Don’t get me wrong. I think everyone had fun. Our routines are absolutely shot. That’s what summer is for, right? Of course. I like the break from soccer and Cub Scouts. I don’t miss the 25 minute drive to The Girl’s tennis clinic. Those routines are supposed to slow down. It’s the basic stuff that has suffered most. I think I’ve been slacker than usual. To give myself some credit, we have been out of town quite a bit. When we were in town, it was swim team season, which makes things a little chaotic. I hate to make excuses, though. We have eaten in front of the TV more than I care to admit. I won’t say that we never do that during the school year, but it’s usually limited to weekend and special occasions. I will add yet another excuse to the pot. Our kitchen table is covered up with a puzzle. My friend Jason gave the kids a 3-D puzzle of Washington, DC, and it’s taken a little time to put together. It’s going to be really neat whenever it’s done. I finally moved it to the dining room table today, so we can go back to sitting down together for dinner. I guess we could’ve just eaten at the dining room table in the first place. Maybe next summer. I’ve also turned into a short order cook. It didn’t happen because I gave in to my children’s whims. The Girl is a picky, or limited rather, eater, but The Boy is pretty good. He’ll eat what I serve. I just haven’t been ready to serve. When we’ve been home, I have cooked some, but I haven’t been as motivated as I usually am. The evenings usually involve The Man asking what we’re having for dinner and me telling him that if he sees it in the fridge and it doesn’t smell bad, it’s fair game. We’ve spent a good bit of time on the deck letting the fine folks at Vallarta serve us. It’s just easier that way. No one has ever called me a good housekeeper, but things have gotten out of hand. The clothes I didn’t use in Ireland came out of the suitcase and into a pile on the floor. They were replaced with clothes for the beach. Anything not worn at the beach is still in the suitcase. I packed a different bag for the lake, so I wouldn’t have to put everything away. We find ourselves getting clean dishes out of the dishwasher at mealtimes, because they never made it to the cabinet. I have taken the trash out, swept, and cleaned the bathrooms. Some. But you know what? We have been spoiled this summer. While I hate that I was away from my kids so much, we all did some pretty great things. I got to see my dear friend marry her love in Mexico. We spent the 4th of July at the lake with family. The Man and I took an epic trip to Ireland. Two days later, we were lucky enough to take our kids to the beach. Our kids love the beach. They rolled in the sand, body surfed, and swam in the pool until we made them go to bed. We’ve all watched the Olympics. Even the boring sports. Even the weird Men’s Sprint that is a bike race and a game of playground chase all wrapped up into an Olympic event. Last weekend, we squeezed in one last trip to the lake. 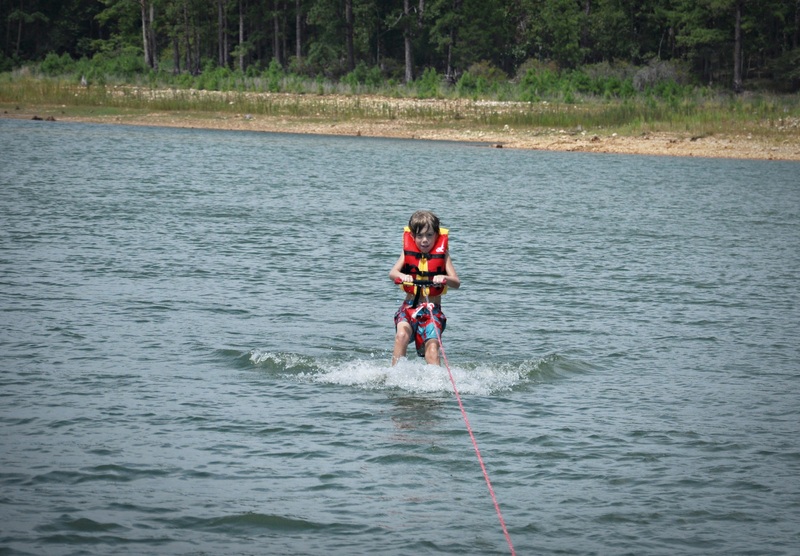 My dad bought The Kids some trainer water skis, so we wanted to try them out. The Boy was scared but determined. His nerves gave way to tears as he floated in the water waiting for the boat to straighten out. He said “Mama, I really want to do it, but I’m really nervous. After asking what scared him most and trying to erase any fears, he was off. The boat pulled away, and I was left in the water, saying prayers and crossing fingers that he’d get up just once. After a few tries, he did! It didn’t last long (I think he startled himself! ), but he got out of the water. I swam over to him, and noticed that he was red-faced and teary. “What’s the matter, Boy?” I was fighting my own tears. “I’m just so happy that I got up. I’m crying happy tears and it’s making me laugh!” We hugged. I was busting with pride. It wasn’t a bad way to wrap up the summer. I’m not sure how I feel about school starting. I’m ready for the routine, but not the hectic evenings. I’d like one more week. So it goes. This year I’ll send The Girl to first grade, and The Boy will be in third. I guess I’ll have to start cooking and cleaning again. Know what? I’m looking forward to it. I’ll bet The Man is, too.